Fashion models displaying designer sarees by Shruti Sancheti at Lakme Fashion Week 2015. Models walked for designer Shruti Sancheti at Lakme Fashion Week Winter/Festive 2014. Model walks in beautiful red and pink designer printed lehenga style saree. Designed by Shruti Sancheti at Day 5 WLIFW Autumn/Winter 2014. Printed flowers all over lehenga and multicolor unique border. It is a pink printed dupatta with multicolor border. Paired with designer sleeveless saree blouse for back. Model displaying beautiful maroon designer embellished saree drape. Designed by Shruti Sancheti at Day 5 WLIFW Autumn/Winter 2014. Embellished patch work designs highlighted on it and multicolor border. Paired with designer full sleeves saree blouse with ‘V’ shape collar neck pattern for back. Model walks in beautiful brown designer printed saree. Designed by Shruti Sancheti at Day 5 WLIFW Autumn/Winter 2014. Orange printed flowers through out border,followed by gold plain border. Paired with maroon designer cap sleeves saree blouse for back with round neck pattern. Model displaying beautiful blue designer plain lehenga. Designed by Shruti Sancheti at Day 5 WLIFW Autumn/Winter 2014. Paired with designer floral printed cap sleeves saree blouse for back. Model walks in beautiful white designer printed saree. Designed by Shruti Sancheti at Day 3 LFW Summer/Resort 2014. Printed rose flowers all over saree and embellished applique patch work border. Paired with designer sleeveless saree blouse for back. Model displaying beautiful white designer embellished net saree. Designed by Shruti Sancheti at Day 3 LFW Summer/Resort 2014. White embellished applique patch work designs all over saree and through out border. Red rose flowers across it. Paired with designer shoulderless saree blouse for back. Model walks in beautiful white designer printed lehenga. Designed by Shruti Sancheti at Day 3 LFW Summer/Resort 2014. Printed rose flowers all over lehenga and embellished border. It is a white embellished dupatta with tricolor unique border. Paired with designer embellished halter neck saree blouse for back. Models walks for Shruti Sancheti at Day 4 LFW Winter/Festive 2013. Model walks in beautiful red and multi color half and half saree. Designed by Shruti Sancheti at Day 4 LFW Summer/Resort 2013. Multicolor stripes half of the saree. It is a tricolor border. Paired with designer saree blouse. Model walks in beautiful multicolor printed lehenga. 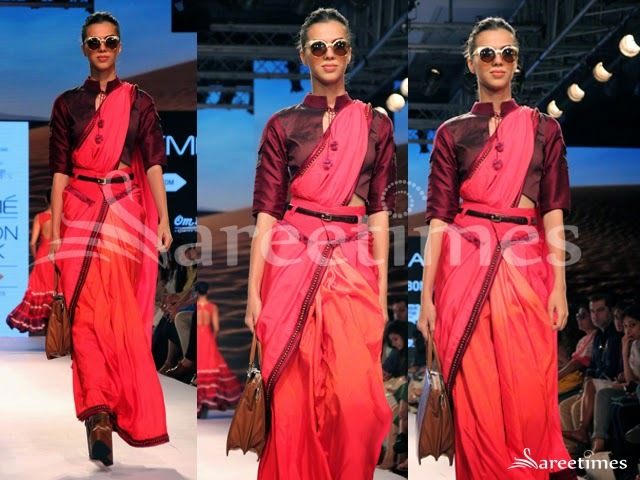 Designed by Shruti Sancheti at Day 4 LFW Summer/Resort 2013. Multicolor stripes all over lehenga and double border. Pink plain border around it. It is a georgette dupatta. Paired with designer sleeveless saree blouse for back with ‘V’ shape collar neck pattern. Bollywood celebrity and designer Shaina NC in beautiful pink designer georgette saree, embellished with patch,mirror,printed and border work paired with designer saree blouse from designer Shruti Sancheti at day 3 LFW Winter/Festive 2012. Model displaying beautiful green designer plain saree with border work from designer Shruti Sancheti at day 3 LFW Winter/Festive 2012. Bollywood actress in beautiful pink designer shimmer faux saree , embellished with patch and lace border work paired with designer full sleeves saree blouse for back from designer Shruti Sancheti at Day 4 LFW Summer/Resort 2012. Models walks in red designer saree with designer embroidered and pink border work paired with designer sleeveless saree blouse from designer Shruti Sancheti. 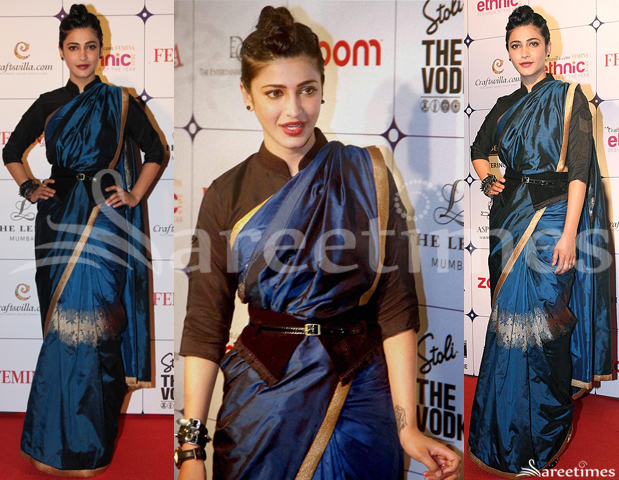 Model displaying beautiful blue designer embroidery saree with designer lace border work paired with designer sleeveless saree blouse from designer Shruti Sancheti.